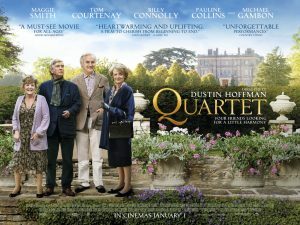 ‘Quartet‘ marks the directing debut for Dustin Hoffman, who is now five years shy of 80, and the two make a great pairing, just like a good wine and cheese. Hoffman took his cues from Ronald Harwood’s play and from a documentary from the 80s that showcased a retirement home for famous musicians and singers. With its stellar cast, charming characters, witty dialogue, and amazing music ranging from The Mikado to the Rigoletto, ‘Quartet‘ is not to be missed. The cast is mostly made up of actual musicians and singers and with the help of a few veteran actors, this story of aging and music should play to not only older audiences, but to younger ones as well. The film takes place at the luxurious Beecham House, which is in the beautiful countryside of England, and looks like it’s from a fairy tale from its lavish rooms and fabrics to the many gazebos, ponds, and trails throughout the entire place. Hell, I’d want to live there. Here, music is life, and for it’s residents who are all above 75 spend their days and nights playing music and singing still. You see, this is a retirement center for famous opera singers and musicians, which include a famous tenor named Reginald Paget (Tom Courtenay), who still sings and teaches a class to young kids every week on opera. He even mixes in rap to keep his young audience listening, all the while, he feels young too as he can be found listening to various rap songs in his room alone. As Hoffman’s camera moves through the fancy house, we meet Sissy (Pauline Collins), a forgetful yet lovable singer who tries to make everybody’s day brighter. Then there is Wilf Bond (Billy Connolly), who was once a singer, but now roams the hallways cracking jokes and trying to get laid whenever he can, but has no success ever. These two characters are so genuine and funny that you can’t help but fall instantly in love with them. A bit of of excitement fills the Beecham House as the annual Verdi Gala is coming up, where most of the fund raising for the year is held to keep the home open and functioning. This is also where all of the tenants of the home get to put on their fancy dresses, get in full costume and make up and put on a show, just like they did when they were younger, all under the direction of Cedric (Michael Gambon), who might be the biggest diva in the room. The other bit of anticipation is that everyone in the house knows that a new tenant will be staying with them, and the rumor is that it is a big star. Well that star finally arrives and it is the famed opera singer Jean Horton (Maggie Smith), who is reluctant to at first to talk with her former colleagues or participate in any programs, let alone lunch or dinner. It is also much to Reginald’s dismay that Jean is there as they were once married, but divorced due to Jean having an affair. However, as they say, the show must go on, and Cedric wants the original ‘Quartet‘ to sing the Rigoletto once more for the Gala, which consists of Sissy, Reginald, Wilf, and Jean. Everybody has agreed with the exception of Jean, and the other three hope they can convince her in time before the Gala to perform once again. I really enjoyed the fact that Hoffman doesn’t mess with the usual stories in telling a tale about retirement homes. There was no talk of the tenants being sad about family members not visiting or even family visiting for that fact. Everything is about the music here and is on a light note, which I loved. As for the performances, Smith and Courtenay are phenomenal. They both prove they still have what it takes to captivate an entire audience and their emotions when they first see each other for the first time in many years, you can literally see the heartache in their eyes and mannerisms. It was amazing. Connolly is my favorite character, as he is the most light hearted and funniest characters in the film. he takes everything in stride and just steals the show. Hoffman’s direction is mostly by-the-books, but captures each performance with grace. And stay for the end credit sequence as it shows the actors paired with an old photo of themselves in their youthful prime. I can’t wait to see this again. 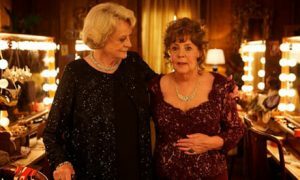 Film Review: ‘The Second Best Exotic Marigold Hotel’! This entry was posted on Thursday, January 24th, 2013 at 6:44 pm	and is filed under Film, News. You can follow any responses to this entry through the RSS 2.0 feed. You can skip to the end and leave a response. Pinging is currently not allowed.